Earlier this year, a few awesome humans came together to discuss a pretty important topic – ‘How do we create an environment for LGBTIQ youth wellbeing?’ LGBTIQ stands for: lesbian, gay, bisexual, transgender, intersex or queer. This korero was co-hosted by Olivia and Kieran, two members of the 2016 Flourishing Fellowship Cohort, and supported by two members of the core Lifehack team. 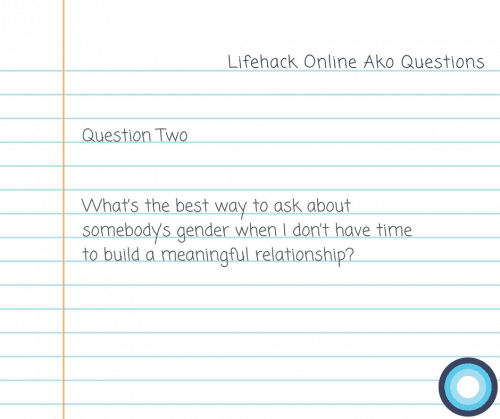 In the spirit of codesign, we asked the Lifehack community beforehand to submit their questions about how to interact with and support LGBTIQ youth. Our hosts then used some introductory processes to setup the session and make it a safe space to talk about this important topic. Our hosts started with an introduction about why we were coming together, and a welcome to all of the participants. We then established some kawa (groundrules) for the session to make it easy for everybody to participate. These included using hand signals to show you wanted to speak (given we were on an online call) and writing down our reflections in a collaborative google doc.. The hosts then opened up a check-in circle where each person had an opportunity to introduce themselves, and describe their connection or attraction to the topic. We then jumped into a Q&A session, using the questions people had submitted beforehand. An hour sped by, and we all agreed we could have spent much more time discussing this together in this online format. We’ve collated together some of the discussion into a Q&A below. 1. What processes could we use to help LGBQIT youth feel warmly welcomed into different spaces? This was a great place to start. One of the key learnings from our joint experiences working alongside young people is the importance of collectively agreeing on the standards of behaviour for a group. One of the suggestions was to start a conversation with: “Hi, my name is … and my preferred gender pronoun is …”. This has two potential benefits. It demonstrates positive gender role modelling and invites a young person who may be gender diverse to tell you (the adult) how they prefer to be called. Incorrect assumptions about gender can be harmless for some people, and significantly detrimental to identify formation and gender expression for others. We also talked about how some people don’t use a gendered title to describe a significant other (eg. boyfriend or girlfriend). The alternative is to use a gender neutral title like ‘partner’, which has a greater chance of opening a conversation up. 2. What’s the best way to ask about somebody’s gender when I don’t have time to build a meaningful relationship? This question came from a lawyer who does a lot of courtroom work. Often they’ll have a client who they meet only minutes before they are representing them in court. This question raises a difficult tension. On the one hand, you want to do the best for the young person you’re working with, On the other hand, some people consider sexuality and gender to be a deep topic that requires rapport to dive into. Ask yourself: how relevant is gender and sexuality to the work you’re doing? Perhaps you could just ask the client: “How would you prefer to be called in court? 3. What resources can primary school teachers use to support children or young people who identify as transgender? Many resources exist: you just need to be careful to evaluate whether they are appropriate for your context and culture. There are some really interesting books and other resources available on Kickstarter, including some books written by queer families for queer families. Check out the Intersex Trust of NZ which has knowledge about how to work with intersex young people. The Agender Charitable Trust are also a good source of advice. 4. What is good practice with bathrooms to help LGBQIT youth feel welcome? We couldn’t find an easy answer to this question. It might depend on the physical environment and your context. So, for instance, it would be inappropriate for an adult who identifies as male to have access to a bathroom with young people who identify as female. But a LGBQIT young person might also be nervous about using a bathroom labelled as “male” or “female” when they don’t fit within one of those two categories. Unlabeled bathrooms might be a good option if you have individual cubicles. If people are only going to be in an individual bathroom, then some of the safety issues might not apply. So, how might you go about starting a conversation about bathroom labeling in your workplace? 5. 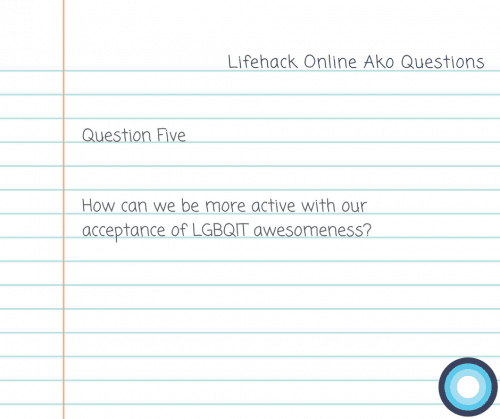 How can we be more active with our acceptance of LGBQIT awesomeness? In reflection, several of the LGBQIT participants felt it was enough just to know there are allies out there. It’s not about needing to do anything major actions. It’s about being aware of your language and being a friend. seeing people talking about it, sharing posts and bringing it to the forefront. “You’re enough as you are” is a good approach. getting involved in LGBQIT community events. ask and refer to your friends in the pronouns they choose. Of course, by reading this blog post you’re already taking steps to be an ally to LGBQIT young people. A person’s identity plays a massive part in shaping their wellbeing. 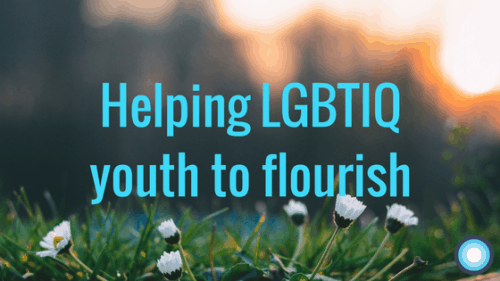 By supporting LGBQIT young people as they explore their identity you might play a small but important role in shaping their future.